One or more photo(s) has been virtually staged. MOTIVATED SELLER! 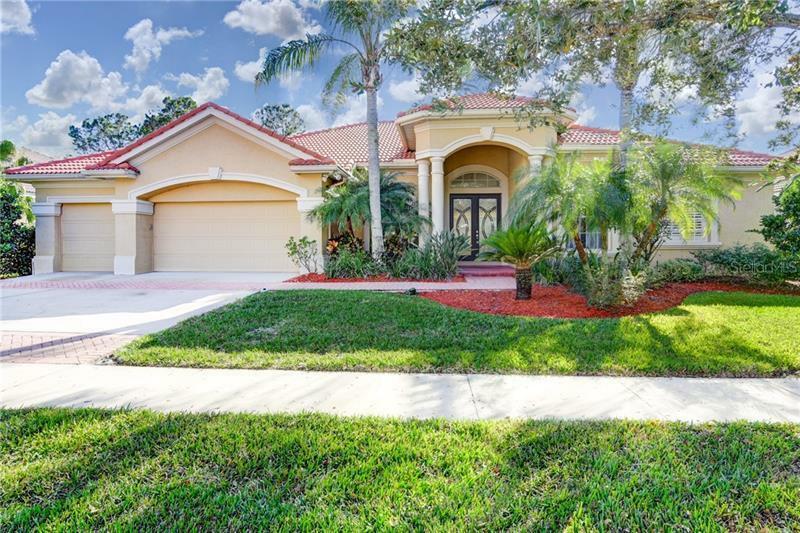 BEAUTIFULLY MAINTAINED HANNAH BARTOLETTA *4 BED *3.5 BATH+OFFICE/DEN+3 CAR GARAGE LUXURY ESTATE SITUATED ON AN OVERSIZED, PRIVATE, WOODED LOT WITHIN THE HIGHLY DESIRED WESTCHASE GATED COMMUNITY OF TREE TOPS! Approach through the DOUBLE GLASS ENTRY LEADING TO THE FORMAL GRAND FOYER & DINING ROOM, WOOD burning fire place, bright Natural lighting and serene views of the private backyard with NO REAR NEIGHBORS IN SIGHT! This kitchen is any chefs dream, extended breakfast bar, REAL WOOD 42â cabinetry, STAINLESS STEEL APPLIANCES, RECESSED LIGHTING +ENTERTAIN within the Dinette, family room, Formal Dining Room OR open the extended pocket glass doors and extend the OVERSIZED screened Patio to bring the outdoors within! SPLIT FLOOR PLAN offers OVERSIZED 2nd, 3rd & 4th bedrooms (easily be a MOTHER IN LAW SUITE) w/WALK-IN SHOWER, access to lanai & POOL BATH! Master Suite is IMMENSE adjoined w/Master BATH, SOAKING TUB, PLANTATION SHUTTERS, EXTENDED WALK-IN SHOWER, DUAL SINKS & HIS/HERS WALK-IN CLOSETS! Private views w/access to backyard wooded lot with sounds of the BROOK, easily create a POOL OASIS! BRAND NEW INTERIOR PAINT, ALARM, NEW SOLAR POWERED WATER HEATER, WINDOW BLINDS, CEILING FANS, HURRICANE SHUTTERS, LUSH LANDSCAPING & NO CDD FEES.Conveniently located close to WESTSHORE BUSINESS DISTRICT, DOWNTOWN TAMPA, VETERANS EXPWY, WORLD CLASS SHOPPING, RUNNING TRAILS, HIGHLY ACCLAIMED WESTCHASE Elem & DAVIDSON Middle Schools, + the MOST BEAUTIFUL BEACHES Tampa has to offer!